Darcy’s Botanicals Organic Coconut & Hibiscus Conditioning Oil is created from an infusion of coconut oil and hibiscus flowers. I’m usually skeptical of hair oils that aren’t pure carrier oils because they’re usually mixed in with cones or some other unfavourable ingredients that may dry out the hair. However, this isn’t the case with Darcy’s Botanicals Organic Coconut & Hibiscus Conditioning Oil. The oil was formulated to condition, add sheen and make hair soft. 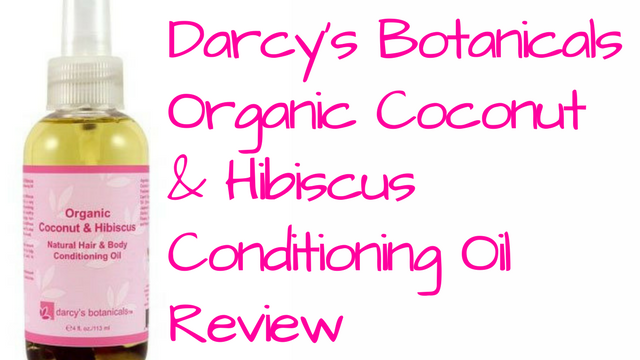 All the ingredients in Darcy’s Botanicals Organic Coconut & Hibiscus Conditioning Oil are organic, natural and vegan. The oil also has a light floral scent, which isn’t overpowering. However, if you’re not a fan of coconuts, you might not like this product. As a sealing oil after applying all other hair products. As the main ingredient in your oil rinsing process. As part of a hot oil treatment. You can spray lightly on braids after wetting once or twice a week but avoid the scalp area. Darcy’s Botanicals Organic Coconut & Hibiscus Conditioning Oil is light and easily absorbed into the hair cuticle after application. It adds great sheen and luster to the hair. It can be used every day without leading to build up as long as you’re not heavy-handed with the application. Though it comes in a 4oz bottle, a little is all you need and it can last for quite some time giving you more bang for your buck. The nozzle is practical ensuring even distribution of the product over your hair and scalp. If you don’t like the smell of coconuts, you might not like this but you can consider mixing something like a few drops of ylang-ylang or lavender essential oil into it to mask the smell. The pros definitely outweigh the cons I could see where this product is concerned. Darcy’s Botanicals Organic Coconut & Hibiscus Conditioning Oil comes in a transparent 4 oz spray bottle with little bits of hibiscus flowers infusing at the bottom. Organic Helianthus annus (sunflower) seed oil, organic cocos nucifera (coconut) oil, Caprylic/capric triglyceride (fractionated) coconut oil, Simmondsia Chinensis (jojoba) seed oil, and organic hibiscus flowers. 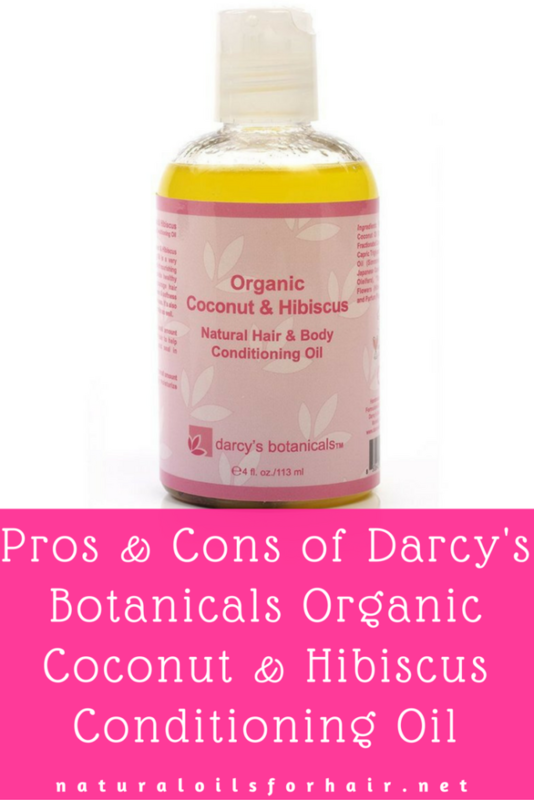 Darcy’s Botanicals Organic Coconut & Hibiscus Conditioning Oil is budget friendly and will go a long way in your hair care regimen. About how long does the bottle last for you? Roughly 2 – 3 months depending on how many times a week I use it. I have BSB hair.